Trust me, if you are a knitter, you want this book! There is a classic arc of knitting skill. In the beginning, most knitters learn the easiest cast on and bind off method. Once you master those, many knitters will move on to a slightly more sophisticated set of memorized cast ons (like the Long Tail Cast On) and bind offs (like Jeni's Surprisingly Stretchy Bind Off, so great for socks and hats). Eventually you might realize that your usual methods just aren't cutting it for you. There are a lot of different cast ons and bind offs that exist in the world, or so you have heard. 99.9% of knitting books and patterns just tell you to "cast on" or "bind off" without specifying. Where do you learn the new techniques? Word of mouth, sometimes. You may hear about something and Google instructions on how to do it. These methods are like fumbling in the dark at the best of times. If you are ready to move to the next level, so to speak, then this is the book for you. 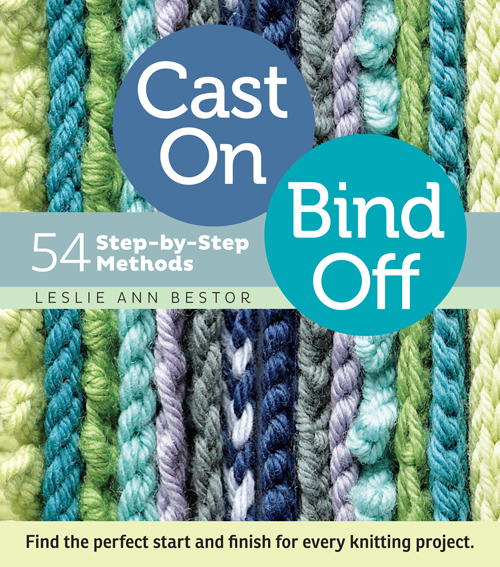 Bestor has collected 54 methods for casting on and binding off. Better still, she has laid out use cases for each. It's one thing to know about the existence of a tubular cast on. But Bestor tells you when you will want to use it, and why. Each method has its strengths and weaknesses, and is particularly suited for a certain kind of work. Having these explained in clear and concise language is like a cheat code for knitting. Bestor even includes photographs showing you how the method looks, from the right AND the wrong side of the work. Genius! I know it sounds like hype, but I am deadly serious when I tell you, my knitting will never be the same again. As for the book itself, it is very nicely produced. The pages are spiral bound, which means that they lay flat. And there is a slipcover, which prevents the edges of the spiral binding from snagging. The book is also smallish (about 6x7 inches), which means that it will fit well in your knitting bag. Trust me, if you are a knitter, you want this book! If not now, then some day.